60% Cotton, 40% Polyester. Oxford: 47% cotton/53% polyester. 4.75 oz Cotton Blend for a light, comfortable feel. 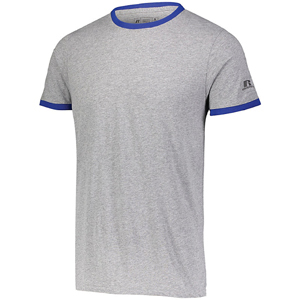 Dri-Power® Moisture Wicking Technology. Odor protection and UPF 30+ provides protection from the sun. Crew neck and set-in sleeves. "R Russell" on left sleeve.